Nowhere is the inspiration Marcel Delgado found in Charles R. Knight's paintings more clear than with his model of the Agathaumus. First is Knight's painting, followed by Delgado's model... Almost an exact replica! Given the significance of Knight's paintings on The Lost World, it is worth taking a look at some of his paintings in this thumbnail gallery. For more on Knight, visit The World of Charles R. Knight. 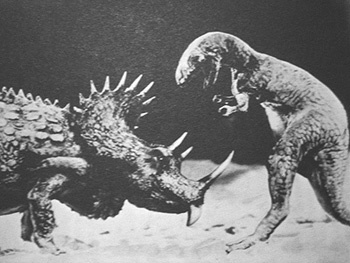 In his famous short features for the Thomas Edison company and in The Ghost of Slumber Mountain, Willis O'Brien's dinosaur models were built largely out of clay and cloth on wooden armatures. Also, while O'Bie attempted to stay truer to science with Ghost, they were for the most part fantasy creations. 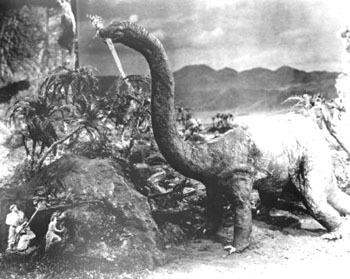 When hired to undertake animation work on The Lost World, he realized that what he had been doing up to that point was inadequate for a motion picture spectacular such as this. Furthermore, the sheer number of models required was too ambitious for him to accomplish alone. The solution to this dilema would come in the person of Marcel Delgado. At the Otis Arts Institute, O'Bie met a young grocery clerk and student assistant who was aspiring to become a sculptor. Delgado picked up the scultping bug by watching and learning from a master church statue sculptor from his native La Parrita, Mexico. 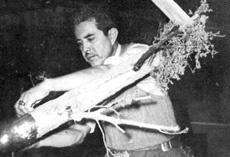 His family moved to California during the Mexican Revolution, where Delgado ultimately landed in the art school. Mr. O'Brien took and interest in my work and one night he asked me, 'would you like to work in motion pictures?' I told him I would not because I wanted to be an artist and didn't want to lose any time. Every time he saw me he asked again and offered me $75 a week to come to work for him. I always said no, and I really know why; I was only making $18 a week but I guess I felt secure. One friday he asked me to lay off work and visit the motion picture studio. OBie left a pass at the gate and when I went in OBie met me and took me to his little shop. There was a 'phone, some cameras and pictures all around. 'How do you like your studio?' he asked. 'It's yours if you want it.' It was a twenty-year-old boy's dream! So I signed up and worked for the next couple of years building dinosaurs for The Lost World. 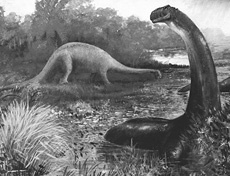 For inspiration, Delgado went to the paintings of Charles R. Knight, the father of modern palaeontological restoration who worked out of the American Museum of Natural History. 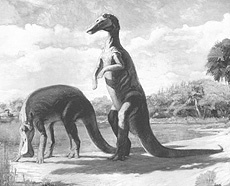 By virtue of this relationship with the palaeontologists of his time, Knight's paintings were as accurate as science could make them at the time, and this worked it's way into The Lost World. Delgado's models, 49 or 50 in total, were exact three-dimensional representations of Knight's paintings, and inherited their accuracy. 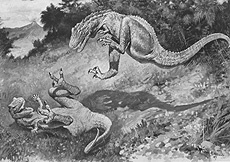 The dinosaurs of The Lost World remain to this day the most accurate ever seen in a movie based on what science knew at the time. The models Delgado crafted were carried by ball-and-socket dural armatures, upon which foam musculature and detailed latex skins were applied. Many of them included an air bladder for breathing effects. After The Lost World, Delgado was relegated to the prop department of First National Pictures until it was bought up by Warner Brothers. Moving to Fox, he built miniatures and props until O'Bie called upon him once again. This time it would be to work on one of the classic science fiction films of all time, King Kong. After Kong, Delgado would stay with O'Bie, working on Son of Kong, The Last Days of Pompeii, Mighty Joe Young, Citizen Kane, and It's a Mad Mad Mad Mad World. Delgado would also do miniature work for War of the Worlds and Disney's 20,000 Leagues Under the Sea. He would pass away on November 26th, 1976.